The woman who has accused U.S. Supreme Court nominee Brett Kavanaugh of sexually assaulting her may be ready to testify – but not on Monday. Christine Blasey Ford, a research psychologist in California, says the attack happened when she and Kavanaugh were teenagers. She called for an FBI investigation into her claim before she would agree to appear before the Senate Judiciary Committee. But now, Ford’s attorney Debra Katz says Ford is open to testifying sometime next week if the committee agrees to certain conditions. 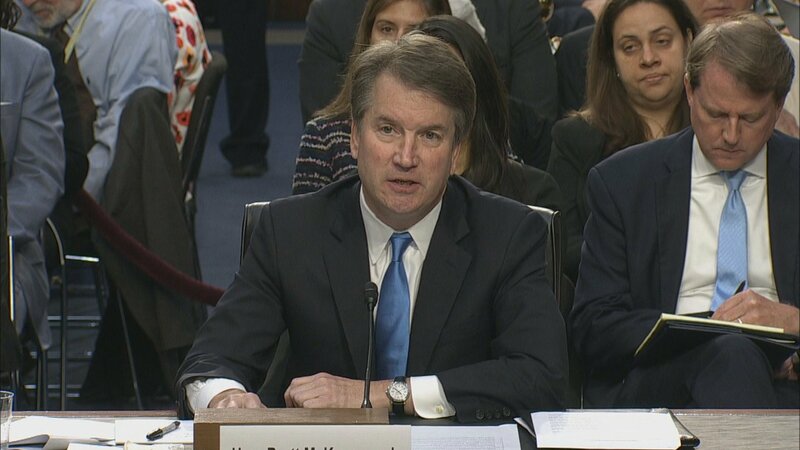 Judge Brett Kavanaugh discusses Roe v. Wade during his confirmation hearing before the Senate Judiciary Committee on Wednesday, Sept. 5, 2018. Meanwhile, as Washington, D.C., reels from Ford’s claim, a nationwide debate has ignited over how much weight should be given to an alleged teenage occurrence from more than 30 years ago. Joe Morris, a partner at the law firm Morris and De La Rosa, said there will most likely never be enough information to determine the truth. Shapiro and Morris join Eddie Arruza in conversation.